Pick up from hotel by tour guide and driver at 8:00-9:00 am. Drive to Xian City Wall (sightseeing for 1 hour) and then move on to the nearby Terra Cotta Warriors Factory (sightseeing for 20 minutes). Take a typical local lunch for one hour. In the afternoon, visit Terracotta Warriors (3 hours) and Big Wild Goose Pagada (1 hour). Last, drop off at your hotel before 6:30 pm. Xian City Wall: The largest ancient military defensive systems in the world. Terra Cotta Warriors Factory: A licensed reproduction factory that displays the copy of terracotta warriors as well as the craft making process, where you are able to buy some micro warriors as souvenirs. 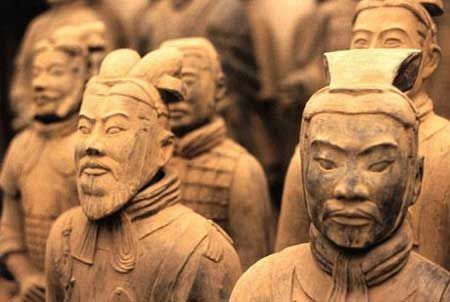 Terra-cotta Warriors and Horses: One of the most significant archeological finds of the 20th century, the life-size army that have been protecting the mausoleum of the first emperor in Chinese history- Emperor Qinshihuang for 2,200 years. Big Wild Goose Pagoda: A holy place of Buddhists. It is the symbol of the old-line Xian city. * Hotel pickup & dropoff & transfer for sightseeing. * Want to join a private tour? Check our 1-Day Private Xian Tour. Our quotation on the website is only including the pick up and drop off address in the Xian city area. If you want to be picked up and drop off from the airport you have to pay extra.